How to sow seeds to get nice seedling form? I have got many questions about seed sowing technique. Today I would like to share my experience of it. This year is longer cold weather not happened in Thailand before. 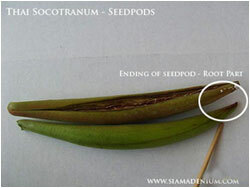 This would help adeniums caudex can store food better and also give healthier seedpods. Seeds are very strong and higher germination rate. We always concern about seed quality affected to seedling quality as well. All of our seeds are harvested from original mother plants so you can ensure they are TRUE hybrids, this won't waste your sowing time with wrong hybrids. Now let's see how we sow seeds in order to get nice seedlings. 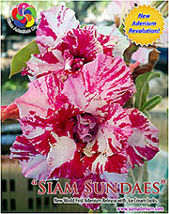 Sowing media can be peat moss or coconut mixing with rice husk powder (1:1). Put the media around 3/4 of basket height then watering it with fungicide chemical until they are soak or you can see the water flow out from basket bottom. This is very important thing because this will protect your seedlings from fungi disease during growing. Sweeping the media with ruler to the same level. Diving the seed one by one in the media following with the root marks that we do in previous step. Cover seeds with peat moss or only coconut powder again around 0.5 cm. If you cover seeds too thick, they might not be able to sprout and die inside. Spraying the surface with diluted B1 (root hormone) again. Next watering time, you should notice the moisture on the media surface. If you see the surface is too dry you can water them by spraying. After 5-7 days, seeds will grow out from media. Water them with diluted B1 again on the 2nd week. You should watering baby seedlings in the morning. During the 1st week to 2nd week, you should put them in the shade or 60-80% slant. On 3rd week, you can take them to outdoor to let them hit with full sunlight. You should keep checking the media not to be dry when you take them outdoor. Mostly I water them twice a day during heavy sunlight. After one month, you can feed them with the NPK fertilizer especially with higher potassium (K) and spray them with nutrients. About one month and a half, you can take them out of basket and putThem in 4 inch pot. Don't forget to water the fungicide chemical once after repotting. 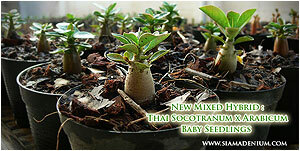 One month baby seedlings (Thai Socotranum) ready to be given fertilizer. You should also concern the hybrid sources before sowing seeds to get better seedling form mostly focus on Arabicum and Thai Socotranum growing in term of Bonsai Form. I think this would help you get nice seedlings. Take care and have a nice day.